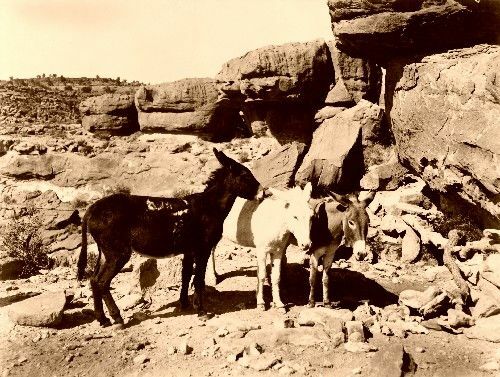 Three donkeys at the Grand Canyon in 1905. The Kolob Brothers, Emery and Ellsworth, built a photographic studio on the South Rim at the trailhead of Bright Angel Trail in 1904. Hikers and mule caravans intent on descending down the canyon would stop at the Kolob Studio to have their photos taken. The Kolob Brothers processed the prints before their customers returned to the rim. Later the Kolob Brothers would be the first to make a motion picture of a river trip through the canyon. The Fred Harvey Company developed the luxury El Tovar Hotel on the South Rim in 1905. The hotel was named for Don Pedro de Tovar who tradition says is the Spaniard who learned about the canyon from Hopi and told Coronado about it. Charles Whittlesey designed the arts and crafts-styled rustic hotel complex, which was built with logs and local stone at a cost of $250,000 for the hotel and another $50,000 for the stables. The El Tovar was owned by Santa Fe Railroad and operated by its chief concessionaire, the Fred Harvey Company. Other Fred Harvey establishments were also built in the canyon, including the Hopi House in 1905, The Lookout in 1914, Hermits Rest in 1914, the Phantom Ranch in 1922, the Watchtower in 1932 and the Bright Angel Lodge in 1935. A cable car system spanning the Colorado River went into operation at Rust’s Camp, located near the mouth of Bright Angel Creek, in 1907. The Grand Canyon was designated as a U.S. National Monument on January 11, 1908. Opponents such as land and mining claim holders blocked efforts to reclassify the monument as a U.S. National Park for 11 years. Grand Canyon National Park was finally established as the 17th U.S. National Park by an Act of Congress signed into law by President Woodrow Wilson on February 26, 1919. 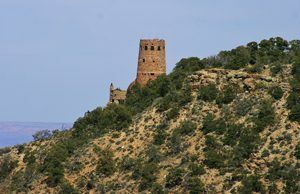 The National Park Service declared the Fred Harvey Company to the official park concessionaire in 1920 and bought William Wallace Bass out of business. In the late 1920s the first rim to rim access was established by the North Kaibab suspension bridge over the Colorado River. Paved roads did not reach the less popular and more remote North Rim until 1926, and that area, being higher in elevation, is closed due to winter weather from November to April. The Grand Canyon Lodge opened on the North Rim in 1928. Much of the lodge was destroyed by fire in the winter of 1932; however, it was rebuilt and reopened in 1937. Bright Angel Lodge and the Auto Camp Lodge opened in 1935 on the South Rim. Trains remained the preferred way to travel to the canyon until they were surpassed by the automobile in the 1930s. 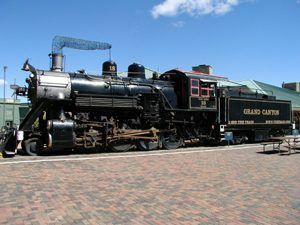 Finally, competition with the automobile forced the Santa Fe Railroad to cease operation of the Grand Canyon Railway in 1968. Only three passengers were on the last run. However, the railway was restored and reintroduced service in 1989, and has since carried hundreds of passengers a day. Today, about five million people visit the more than 1,900 square miles of the Grand Canyon National Park each year. While at the park, you can enjoy its numerous hiking trails, mule rides down the Bright Angel Trail, river rafting, fishing, and camping. There are also about 2,000 known Ancient Puebloans archaeological sites in park boundaries. Numerous visitors’ centers provide information, and lodging and restaurants are located within the park.